This book gives us a more complete and up-to-date story of mankind than ever before, blending scientific and literary discovery with the biblical record to tell a new story of beginnings. It might seem inconceivable that the Book of Genesis would need revising after all these millennia. 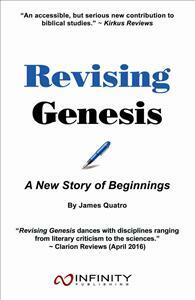 But that is exactly what this author shows using the latest methods and evidence available, including a literary analysis of the Genesis text, testimony from the most ancient witnesses, and recent scientific discoveries. Using all pieces of the puzzle, this book gives us a more complete and up-to-date story of mankind than ever before. This book reveals the true story of what happened and when it happened, bringing down the walls that have divided Genesis and science –all those millennia.